Freetown, the capital of Sierra Leone, has significantly changed. The war that lasted over a decade saw a lot of people fleeing the provincial towns and villages for the capital. Since the war ended many have simply opted to stay, over-taxing the city's meager resources. In a recent statement, Freetown's mayor, Winstanley Bankole Johnson, said there are over a million people currently living there. According to officials with the country's statistics office, the city of Freetown alone accounted for nearly one out of every six people counted in the [last] census taken in 2004. The mayor characterized the city's residents as, "all scrounging for access to basic social amenities that have remained unmodified since 1961, their pre-independence dimensions, to compliment changing circumstances." Filth and congestion, with Freetown possessing an insufficient number of houses, have become the marks of the city. So people have resorted to putting up shacks wherever they can, turning a once beautiful city into a slum. Hawkers and beggars ply the city by day. Until recently, fires could be seen in parts of the capital as garbage piled several feet high along the streets went up in flames from the heat it generated. However, just outside of Freetown, along the peninsular road, things begin to change. Despite its great natural beauty and breathtaking beaches, life in the village of Kent is tough. But the spirit of the people here is proving equally so. The residents of Kent are different in many ways, yet they all seem to have something in common — most of them have left Kent several times but have returned. Everyone knows each other, and they all unreservedly demonstrate a sense of pride for their poor, quaint, quiet village tucked in the woods — about an hour from the capital Freetown. "It's my village and I'm very proud of it," said Balogun Williams, 76. "Yes, it's a very poor and difficult place to live, but I have a satisfied mind. Life is normal, we only live by fishing, and the fishing currently is very bad, so we're a poor people. Let us not try to hide it. But it's a beautiful place to be." The retired police officer, now a community volunteer, who returned to Kent from Freetown said there is no other place he could have gone. Parents are likely to hear from him if a child is consistently late for school. He would also be the one knocking on doors asking why a child has not been to school. He lives a few feet from the Rural Education Committee (R.E.C.) School, which has a disturbing past. During the 17th and 18th centuries Kent was a base for slaves that were captured from surrounding villages. It was during this period that the two churches in the village were built, along with slave quarters. That building is now the only primary school in the village. Its foundation was once a holding place for human cargo, awaiting a sea journey to England and the United States, where they were sold. "The dungeon is being preserved, but not in an extraordinary way," said Williams. "We feel it's important for the history of Kent." The wooden floor of the red brick building that once functioned as slave quarters has been replaced and its open floor plan partitioned to create classrooms for the 100 children now attending school. Generations have gone through these doors, once closely guarded by slave owners, to complete their primary education before having to trek out of the village daily to continue schooling elsewhere. "I spend a lot of money in transportation to make that possible each week," said Mrs. Phebean Henry, 49. "This is why it's necessary for us to get a secondary school." The need for one existed when she attended R.E.C. school. Her two children studied there, during the time when her husband was its headmaster. But the need is still unfulfilled. It was 200 years ago that Britain outlawed slavery, but here in Kent the schoolyard is still called the "slave yard" and it is here that Henry says another building could be constructed alongside the Portuguese-built colonial building. Sierra Leone has known peace only five years and its economy is depressed, leaving areas like Kent starving for very basic needs. Schoolteacher Denis Moore, 50, spoke of the realities of life at the school: "One of the most daily painful experiences I get at school is seeing children sit in class and not doing classwork. When I ask them why aren't they working, they say 'I don't have a pen or book.' That makes me really sad. I don't like seeing that happening." Moore has a wall to use as a blackboard, though he says he's in dire need for books and other teaching materials, such as charts. The 40 children attending the nearby pre-school use empty food cans to play educational games with. Christiana Sesay, 25, is also a teacher and says she likes playing games with her students but that they don't have any educational games. "The kids I teach like numbers, so it would be useful for me to be able to get games that are based on numbers," she said. Despite the pervasive poverty, residents, simply out of pride for Kent, continue to pull together to keep life going. But what the villagers are most pleased about hangs several feet above their heads — coconuts. "I'm very proud to say I'm from Kent and this is Kent coconut," said Henry. The fourth oldest person in Kent has been fielding requests for her homemade coconut oil for over two decades. "I do not make enough money from it, but I do love doing it very much," said Eleanor Palmer, 69. 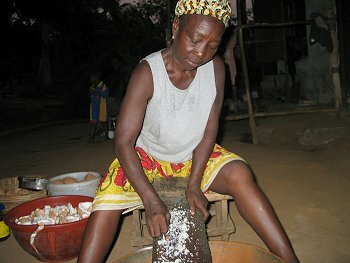 When she's not up until 3 a.m. grating coconut, she's taking care of children at the pre-school. Kent residents also take pride in their beach. Sierra Leone has some of the most beautiful beaches in the world but tourists who've been to Kent's describe it as a natural wonder. Unlike many of the other beaches in the country, cared for by underpaid government staff, the one here is cleaned daily by the village youths. They spend the rest of their time fishing in the ocean, which saved Kent from the destruction the rest of Sierra Leone experienced during 11 years of war. At 84, Abioseh George Harding is the oldest Kent resident, but when rebels terrorized Kent he was one of the few who did not flee to neighboring Banana Island. He was the village headman. "Every evening I went into the bush and hide and came out in the early hours of the morning," Harding said. He believes the rebels did not enter Kent, because if they did the village would have been trapped as the only other exit was out to sea. There are no shops in Kent and the local economy is very much informal. But Williams says that is changing slowly because "our brother George Labor is now taking Kent to higher heights." Labor is not from Kent, nor has he spent much of his life in Sierra Leone. But he is a force for change in the village. "When I retired from the U.N., I went to Manchester University and started a doctorate on post-conflict development," he said. "Added to that, I was also looking at poverty alleviation in rural areas. My objective was to come back home and to see how I could best help in my own small way at addressing the issue of poverty in Sierra Leone. I've decided to contribute by developing this outfit." The "outfit" is the Sengbeh Pieh Holiday Resort, which is named after a slave taken from Sierra Leone to the United States, and has been changing Kent and the lives of its people. Its traditional en-suite round chalets with thatched bamboo rooftops were built with local hands and Labor says he has "about 50 people on the payroll now, which for a small village like Kent is quite substantial." Labor says he's trying to activate the dormant economy of the village and plans to soon begin sea excursions to the neighboring islands of Turtle, Bonthe, Banana, Maroon and Bunce, as well as a bus tour once he has found tour operators from Europe ready to invest. Meanwhile, the resort is a regular spot for expatriates and the few tourists trickling into Sierra Leone. Henry posited that development like the Sengbeh Pieh Holiday Resort is paving the way to restoring their village to its former glory. She hopes that one day the village will get "a nice community center, a secondary school and an improved health center. All these are the things I will be praying to see in my lifetime, by the grace of God." View the Worldpress Desk’s profile for Michael Davies-Venn.